Good evening, My name is Scott and I am new to this forum but very excited about everything that I have read thus far. I have looked at an Island Gypsy 36, 1985. I've looked at numerous trawlers of every make, model and layout. I keep on coming back to the IG 36. You just cannot beat the amount of water tank storage onboard and the separate stall shower. 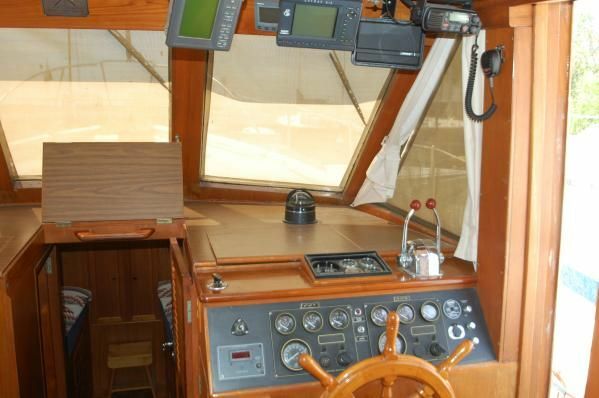 The boat I am looking at has the traditional "GB Classic trunk-cabin" design commonly found in most trawlers. Can anyone set the story straight as to what is under the decks and what concern if any that I need to be made aware of regarding the strength of the decks and the chances of needing replaced?I read on a separate website that stated its solid fiberglass under the decks. Also any other information on the boat I would be extremely grateful. I am going to see her again tomorrow for a thorough inspection of the boat. I look forward to hearing from everyone. I have a 1981 IG 36,hull no.39, built by Kong & Halvorsen. Single fwd sleeping cabin,separate shower and head.Extended flybridge and covered side decks. 4 water tanks, one either side plus under the fwd berth and in the aft lazarrette.Generally they are a well sorted boat with Halvorsen origins, maybe an advantage over some "Taiwanese Trawlers". The electrics are usually well done. My pre purchase survey says the decks are fibreglass with laid teak. But I`m sure water penetrates the decks. Maybe water gets between the deck and the laid teak.My next big job is recaulking the teak or taking it up and fibreglassing instead. Check for are osmosis, IGs are very prone to it. Check the black iron fuel tanks for corrosion, especially on top. If you have timber window frames(likely) check for rot and plastic filler repairs, expensive to repair/remake. The sliding windows have inner and outer drain holes which can block, causing rot. Hello fellow 36'er and greetings. Not sure if you talking about an aft cabin model or the Europa style. To my knowledge the 36' aft cabin, or more formally known as the quad cabin,don't have seperate shower stalls.Still maybe your side of the ocean they did. The decks on a 36 are teak screwed to a fiberglass bed, below the fiberglass are hardwood blocks that make up the core, and beneath that a thinner second fiberglass bed to encase the wood core.There have been lots and lots of discussions on the forum about this setup, pros and cons etc. Have a trawl through the forum library. Teak decks are a matter of choice, I had to replace the core on our boat and decided to finish it off with a new teak deck(glued not screwed)some other members can't wait to get rid of the teak, there is no right or wrong on this.When checking the condition of the deck first walk around the decks in bare feet, they should be firm ,no bounce. Also check the condition of the sealant that binds each peice of teak together, it should still be pliant and stuck down especially at the edges. Whist the decks are not solid glass the hulls are, and appear to be stronly built.Check for signs of Osmosis though.Also check for any wood discolouration around the windows that may be water damage, not a deal breaker but keep it in mind. In the engine bay look carefully at the top of the water, and particularly, the fuel tanks for signs of rust, or any attempt to disguise rust issues. Replacing tanks can be a nightmare , especially if you have twin engines.The rust often forms from the screws of the teak deck above becoming loose and lettiing water pool under the deck running down the water and fuel filler pipes.If you have rusty tanks good chance you have deck issues. Some IG36's have long range water and fuel tanks. The extra water tank is below the front V berth and the fuel tank runs across the boat at the back of the engine bay. Older IG's have cable steering, open up the lazerette at the stern of the boat and & lift up the floor to reveal the steering quadrant, it should be well greased and so should the steering cables. Check the quadrant steering supports are in good condition and not rusted. While looking in the lazerate check to see if you have an outside shower, the controls are fixed to the inside stern of the boat with the hose running out just under the top step that leads onto the swim platform. if you have this set up turn it on to check if it is leaking, if it is it water will make its way down into the bilge. Aslo, checks the shower drain pumps are working and not just dumping water into the bilge.Turn on the boats fresh water system and listen to see if it self primes when no taps are on. This will give you an idea on any internal fresh water leakage under pressure. I hope that gives you something to start with. The above are all issues I have come across in my IG over the years. In Trawler Forum we all think that our boats are great , the only difference is that in the Halverson forum we know our boats are great. Interesting Andy and I came up, independently, with similar issues. And Andy has actually reworked his decks. Mine don`t feel spongy,but I get water entry at about deck level at a couple of places; with the resealing I`ve done I suspect it is getting between the teak and the fibreglass deck and travelling into the boat. We are keen to hear how your inspection goes. I forgot to mention my IG is called a "Europa" version. Thanks to everyone for your tips and advice. A couple things to note as I viewed the IG again today while its one the hard. The boat is in the Philadelphia, PA area and will be coming back down to the Chesapeake if not sold or if I purchase it then it will be based out of Annapolis. My broker is also a surveyor and while he cannot officially survey the boat since he's the buyers agent, he can and did poke around. He assures me that everything is completely sound and I have nothing to worry about regarding the teak decks as he explained to me about how they are built. 1. There are noticeable water stains on the teak beneath the windows, however the owner was present and assured us that he has remedied that issue years ago buy rebedding each and every window in the boat and with the cabin doors as well. 2. The boat is what is called a Quad cabin and she has three Cruiseair systems onboard. She is a twin-screw with Volvo Diesels. The engines have 2800 hours on them and 1300 hours on the Westerbeake generator. The owner also has records on every maintenance item completed since 1986. He is the third owner and its had relatively light use. 3. The owner tells me that the boat holds 200 gallons of water and there are two tanks forward, one under each of the bunks in the forward stateroom and that he has two more smaller tanks in the engine room. The boat holds 400 gallons of diesel. 4. I did not know about the osmosis issue, but I am sure that would come up in a survey, but now I know to look for that, so thank you so much. 6. I got into the Lazarrette, I didn't notice a shower as was noted however it was completely overly stuffed with fenders, hoses, power cords, etc so I wouldn't have known if it were there or to check below to the steering cable for grease. All great things to know. The boat is coming out of winter storage mode so of course things are not as they would be had the boat been in its slip. Thank you all for your suggestions. This boat which will become my home is a great example to me of a high-quality built boat. I am very excited but of course a little nervous and you all are calming those nerves a bit. Its great that this forum exists and I will keep you posted as to whats going on. I hope to make an offer in a couple of days. Meanwhile here is the link to the listing in the event you see something that you might want to point out. *Hmmm... hey Scott, nice lookin boat but I got a question. It says twin diesels and shows the back end with twin screws but the helm and flybridge got me puzzled. Do both work of the same controls??? Looks like two sets of guages too..* First time I noticed this on a trawler i.e. twin screws / signal control. Just learn something new!! Scott, remember although the broker is no doubt a great bloke he works for the owner, it is his job to sell the boat. Get your own independent*surveyor & not one recomended by the owners agent. Your own*surveyor and a damp meter will determine that. No, she is a tri cabin, a quad cabin has small bunk cabin forward on the starboard side., with the head/shower opposite on the*port side.Your configeration allows for a larger forward cabin with two beds,as against a quad cabin which* has a forward V berth. Mine is a quad, however I like your set up a lot.Regarding engines ,get a mechanical report, engine hours seem about right. Did you look at the tops of the fuel tank? Get your surveyor booked in, that shows the owner*you are serious, then lock down the final price after the mechanical report. If I am understanding your comment, then Yes you can drive this boat from either the pilothouse or the flybridge. Those are Morse controls and they are ones that incorporate both the throttle and clutch into one shifter similar to what we are seeing nowadays on many new boats. The only difference is that these are much less complicated. There is a switch that can turn off the controls for the bridge in case something or someone would accidentally hit them. Hope that answers your questioons. Oh and there are gauges on both levels, however the gauges that you see up on the console in the pilothouse are actually for the Westerbeake Generator and the engine gauges are directly in front of the wheel, just like on the bridge. The broker that was present was MY broker, not the owners broker. The owner was the other person there and I did have indepth conversations with him about the boat which was very rewarding. There will definitely be a full survey performed prior to purchase, my insurance requires it and I would never go without. I've heard to referred to as a Quad Cabin, but thank you for clarifying me. Its always nice to learn the correct terminology for any boat. I did not look at the tops of the fuel tanks but you can bet that I will be looking upon next inspection. There is no doubt in my mind that he's a proud owner, you can see that in how he talks about the boat. The pride of ownership is obvious and he's only selling her because there not able to use it as much as they used to and are working on other projects is what I gathered. He said that it would be a sad day when he sells it, but knows that its time for now. Thanks again for all the comments, what an amazing forum here! *"Missed by that much" as Maxwell Smart would say. On Friday I am taking daughter and friends for her post 18th party bash to the Basin for a swim and* BBQ . I can't stay overnight as we are selling our place and have to get it ready for an open house inspection Saturday . *Pity it would have good to catch up and compare IG's. Much rather be at the Basin*overnight and have the 'Cappuccino Boat'* bring me a coffee and the *newspaper in the morning than scrubbing floors and cleaning the kitchen. Have you been up this way before in the boat, it's a great cruising area, especially around West Head into the Cowan waterway system. 1. I If you windows are aluminum framed I understand the idea of "rebedding";if they are timber framed that could not happen.Repairing and replacing timber windows is complex and costly. An odd water entry point on my boat was under the "eyebrow" mould where the flybridge deck joined on, above the windscreen framing. The water entry caused considerable timber rot.Another odd water entry point was the wood block where the LPG piping from the flybridge enters the upper deck, water ran along the pipes and dripped from the LPG valve set into the cabin ceiling; I resealed the block. 2. Most early 36s had Ford Lehmans or similar of 120-135 hp; some later ones had 200hp Volvos which are more power than the boat needs,I even saw one with trim tabs (on a trawler!?). Provided you can operate them at a speed to reach operating temp they should be fine. 4. As your boat is in dry storage this could be an opportunity to treat any osmosis,though usually it gets ground out and left to dry. However you need it in the water to test the mechanics,so that may not work. A good time to spot blisters is just as the hull comes out of the water, but an expert should be able to determine if there is osmosis present, dry. Don`t underestimate the cost and inconvenience of rectification. 5. My cable steering has given no trouble. 6. Lazarettes are like that,especially big ones like this,I keep thinking about dividers and racking to organize it better.Check the timber drains around and across the lazarette,also the condition of the piano hinges,screws,and the timber the screws go into. The lazarette hatch/doors are heavy and impose strain. And never get hit on the head by one closing while standing in the lazarette, very nasty. Your system of a "buyers broker" is unlike here,where many sellers use a selling broker, some are reliable and honest, some are something else entirely. The buyers safeguard here is the surveyor, some are better than others. When I was looking for this boat,I had a written checklist,to make sure I looked at things myself,and to compare boats.You will be the one doing/funding the repairs,so satisfy yourself on any issues,using available advice. Here the initial agreed price is effectively "provisional",it may well be "adjusted" once the survey is obtained. Thanks for your continued advice. The owner told my broker and I that he replaced/rebedded all of the port holes and the hatches. I am not sure about the main windows, however the windshield from the pilothouse one the outside is wood trim that has been painted with caulking to create the seal. Further inspection of the windows appears to show what looks like metal framing but now that you mention it I remember my broker telling me that he doubted it was metal framing on the inside, rather teak that was treated or painted a copper-look. I do not know about the side windows, I do know that one of the back salon windows is glass sandwiched on both sides by wood with caulk for seal. I will make sure that the surveyor takes an extra look at these. The owner told me that he and a friend took the doors off and installed stainless rollers on the bottom since the previous was wood doors sliding on a wood frame. There is no LPG on this boat as the stove/oven is electric, but I know the radar and other electronics/lights from the mast must enter somewhere as I saw where the Radar cable comes down the side of the mast and meets the navigational cables that come out of the bottom of the mast. *Both of these cables feed into the bridge-deck under some molding on the port side. I will have to trace to see where those go. My long term plans are to replace the wooden mast with an aluminum one and therefore running all cables up the interior of the mast. This boat has the Volvo power. The listing says total power is 330HP which means its 165HP apiece. Yes this boat does have trim tabs and I agree I cannot fathom the need for these since your not getting on plane except for "leveling" the boat. My broker (who is also a surveyor, but as I previously stated cannot survey my boat) looked at the bottom and didn't see any visible blisters and I asked the owner about that and he said there are none. Clearly a detailed survey will find those. I did ask my broker about the fuel tanks and any rusting and he told me that he knew to look for that and there was none. He may have mentioned that to me but as you can imagine I was a little over-whelmed with all of the information that was being thrown at me by the owner and my broker. When it comes to the Lazarette and any other items I will be going through the boat after survey and purchase with a "fine-tooth comb" and will fix and/or replace anything within in reason that is, that needs to be replaced. Luckily for me I work for West Marine, the major retailer in the US and other countries (not sure if we are over there yet) of all boating supplies. I have a great discount which I am looking forward to exercising on my new boat. I'm also big into organizing, so alot of what was in the Lazarette was there for winter storage and I saw plenty of other places to store some of these items. Others like power cords, fenders, dock lines and the like will be used all the time as the boat will remain in the water all year long since I will be living aboard. Here in the US you have listing brokers and selling brokers. My broker does both but in this case the listing was from another brokerage firm. My broker contacted the selling agent to arrange a time to view it. I hope that answers your questions and thank you for all of the information, it has been invaluable! We are back from a week cruising on Broken Bay/Hawkesbury River cruising grounds. So near to Sydney,just 18nm up the coast,but so remote, surrounded by National parks. On the way north, in a southerly wind around 20-25 knots,and a 2m swell, we hit 22.7kmh going down the face of a wave passing/breaking under us (we set the GPS/Sounder metric, that`s how we marked up the anchor all chain rode). Only thing to fail was the head, fortunately as we cleared Barrenjoey Head on the return trip. Scott,don`t keep us in suspense,how is the purchase process going? Unfortuantely the purchase process is not going. I was outbid by a last minute buyer that came out of no where. Apparently the owner was also advertising the boat for sale in addition to the broker whose contract was running out. Long story short, I didn't offer enough money in fast enough time. *I was quite upset for many days and devistated. But life does go on and there are plenty other boats out there. Just not plenty of Island Gypsy 36's! I have moved on and am presently looking at a Sabreline 36' Fast Trawler that is similar in look, but in a much newer and updated fashion. Here is a link of one of the boats that I am looking at. Luckily there are a number of these on the market in case I don't get this particular one. I look forward to hearing what everyone has to say about my new choice. Sorry you missed out, but there is usually another,sometimes even better boat. And newer can definitely be better. You can learn from the unsuccessful transaction.There is a nice tradition about the IG,especially in Australia because the brand has a Halvorsen origin and Halvos are held in high regard,people spend huge amounts on restoration and repair. That said there are many boats which may fit your needs. I`m guessing the "original",ie Grand Banks,on which so many "Taiwanese Trawlers" were based cost more,but they are the standard, and have recently become much cheaper here, so has everything as people weathered the GFC, and currently want to save,not spend. I actually think the boat you were looking at was "overengined" with 2 200hp Volvos. If you can avoid turbochargers do,not necessary in a trawler, and expensive to maintain. The venerable Lehman, or Perkins, are well suited. Every boat will have pluses and minuses,its a question of balance. Scott, bad luck on missing out on the IG 36' it looked a nice boat. I am not flamilar with the Sabreline 36', looks to be an interseting design though. The upside, as Bruce says, it is a great time to buy, on both sides of the pacific, so wait. Don't let your money burn a hole in your pocket. Thanks Bruce and you make some great points there. Who knows where I will end up now. I do know that the design and layout of the IG 36 is hard to beat, especially with the separate stall shower and all of the storage. The Sabreline 36 is the only model of that size that accomodates a stall shower (that I at 6'4" and 270 lbs can fit in and move around). As a liveaboard that is an important thing. The Grand Banks 36 doesn't have a stall shower until the later models and thus far I cannot find one for under $200,000 that is in nice shape. This Sabreline is part of the Sabre Yachts family thats comprised of high-end sailboats, lobster-style powerboats and trawlers. Its a US brand built in Maine, so its different in styling and looks since it has no Asian roots. Do you have any suggestions on other choices that I am not aware of? Andy your IG shown in your profile picture is standing proud and beautiful! Is yours the classic model like I was looking at? I am also liking the Europa model. Hi Scott, yes Sarawana is the classic model, however a little different from what you were looking at . My boat is known as a quad cabin, it has an extra bunk cabin in lieu of a larger forward berth and sepertate shower. I checked the archives and found a post on Pacific seacraft 38 T boats, have a read.